Lots NEW! We hope that you enjoy this collection of printable Christmas cards. These cards print onto one A4 or letter sized sheet of paper or card and fold once for A4 size or twice for A6 size, depending on the design. We've got some really lovely, professional designs here. You could even make them extra special by getting the kids to add a dab or glitter or a sequin here and there! We have two sizes of this pretty Christmas baubles card, a larger card that can be simply printed and folded in half, and a card that can be folded twice into an A6-sized card. The background of this Christmas colour pop card is already coloured in a lovely red - so the kids just need to colour in the rest of the design to make a fabulous card! For best results, print using the borderless settings on your printer. This lovely nativity scene Christmas card is perfect if you need a last minute card for someone. Just choose from one of our two sizes of card below (foldable to A5 or A6), print, then fold. The beautifully illustrated Christmas pudding on this Christmas card looks good enough to eat! Available in two foldable versions: A5 or A6. This fun, printable reindeer card will brighten up anybody's Christmas! We have two versions of this lovely card to choose from, a larger card that folds into A5 size, and a smaller card which folds into A6. This has to be one of the cosiest Christmas rooms we've ever seen! Print this gorgeous card (using borderless printer settings if you prefer), fold in half, then send to your friends and family this Christmas time. These gorgeous printable Christmas cards have a lovely hand-drawn style that's bound to go down well with whoever receives them! Print onto some good quality card (we recommend using the borderless setting on your printer), then fold in half. There's a lovely simplicity to the design of this pretty Christmas card, and you can choose from our smaller A6 card (with a message ready-printed), or our larger A5 design. This pretty snowy scene with simple Christmas trees would delight anyone at Christmas! Choose from either our A5 version or smaller A6 version (you'll need to fold the A6 card twice). We love the beautiful illustrations on these Christmas cards, and they're perfect if you need to send a last minute card but haven't got time to pop to the shops. Some of our visitors may recognise the image on this printable Christmas card as the one we used for our 2009 Advent Calendar! Just print on A4, preferably with "borderless" settings, then fold. Print this colourful card featuring a cosy winter scene and send as a Christmas card, or a thank you card for your presents! For best results, print using borderless printer settings. This printable Christmas card - "We all want some figgy pudding" - prints simply and quickly onto A4 paper and then folds twice. Cute! 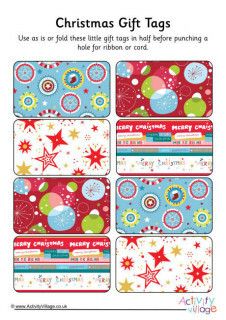 Here's a really pretty and modern Christmas card that you can simply print onto some good quality card then fold. Perfect if you've run out of cards! This simple but very pretty Christmas card is perfect when you need a Christmas card in a hurry - simply print onto some white card and fold in half. There are often lots of outdoor ice rinks pop up in towns and cities in winter, especially near to Christmas. Maybe send this card to someone asking them to go ice skating with you? This pretty little Christmas card can be printed onto a sheet of A4 paper and simply folded in half twice to make an A6 card with message inside. Of course if you prefer you can print onto card and just use the bottom section. Need a last minute Christmas card? Try printing out this very cute Little Christmas Angel card. Just choose the version you'd prefer (foldable into A5 or A6), print, then fold (you'll need to fold the A6 version twice). This cute little reindeer card is a perfect way to wish someone a Merry Christmas! Just print onto A4 paper and fold twice. There's even a Christmas greeting inside. There's a pretty little Christmas tree on this lovely card, which simply prints onto A4 paper and folds twice to form an A6 card with Christmas greeting inside. Grab some pens or crayons and colour in this girl wishing everyone a Merry Christmas - the background already has a lovely red patterned design, so your colouring will really leap out of the page! Print using borderless settings on your printer for the best results. This wintry scene featuring two little robins would make a great last minute Christmas card. For best results print using borderless printer settings, then simply fold in half. This fun card featuring Santa heading down the chimney will give someone a chuckle this Christmas! Choose from two versions below: A5 or A6. Santa says "Ho ho ho..." on the front of this cute printable Christmas card. Use A4 paper fold twice. This clever printable Christmas card prints onto an A4 sheet of paper and then is folded twice. An angel holds a "star of wonder". Do you know someone who loves all things vintage? This Christmas card with a lovely illustration of Father Christmas card will be perfect for them! It looks great in the larger A5 version, and just as good in the dinky A6 version! This pretty vintage Father Christmas greetings card is full of nostalgia! Choose from our larger A5 design or smaller A6 card below. Our very cute 'We Three Penguins' printable Christmas card is sure to be a favourite of anyone lucky enough to receive one.